Rope and nets of all kinds have been made at Bridport for nearly 1,000 years. In the past the bulk of the rope output was for the rigging of ships. But ropes for gallows were also made there, and the hangman’s noose was nicknamed the “Bridport dagger”. The town was the biggest net-making centre in Europe. The long gardens at the rear of the houses were used as rope-walks, places where the flax strands were Laid Out and twisted into shape. and it is still Europe’s principal centre for the production of fishing nets, lines, and cordage. These fascinating local trades are featured in a permanent exhibition at Bridport Museum and Art Gallery. Also here are exhibits showing the archaeology, geology, and natural history of the area. Excavations at Maiden Castle in 1937 revealed the bones of men killed whilst defending the fort against the Romans. After the battle of Worcester in 1651 Charles II came here to hide, rather incautiously, in ‘the best inn in town’; this now contains a shop. 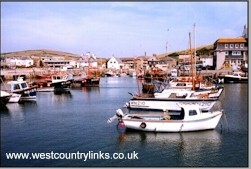 A port since the 13th century, West Bay is still used for fishing but additionally caters for small cargo boats and pleasure craft. At one time it served as a harbour for Bridport, which lies 13 miles north, but nowadays it supplements its port business with resort facilities such as piers and a promenade. Sailing and water-skiing in Lyme Bay from Lyme Regis, West Bay and Portland.